We sell the cutest dress-up clothes around and we are constantly finding new venues to sell them in. They are widely popular! We have not met a child (or adult for that matter) who does not love to be creative and dressup. You can purchase them on our website or you can earn extra cash or get a free one by hosting a party. One of most little girl's favorite thing's to do is dress up! Our little princess loves to dress-up every day.....and yes, sometimes she even wears her costumes out and about....to the supermarket....to ride her big wheel (yes she's that kind of a gal ;) etc. We have had so many costumes however, not all of them hold up well and withstand the washer (which is necessary when one is riding around on a bike in one's princess attire;). My Cute Dressups has a wide variety of dress-up costumes that are ALL washable! They have the most beautiful dresses to choose from too! 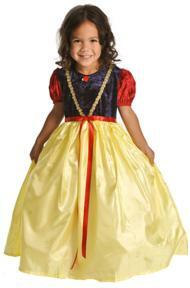 The princess was delighted to review the Snow White costume from My Cute Dressups (pictured above). She's worn it several times now (yes, it's even taken a spin or two with her on the big wheel) and it has held up just perfect in the washing machine (we have either hung it to dry or put it in the dyer on the fluff setting). My Cute Dressups offers some amazing dress up costumes that I'm sure every little princess would be ecstatic to receive this Holiday Season ( such as the Winter Beauty Dress pictured above top)! Great Holiday Gift! 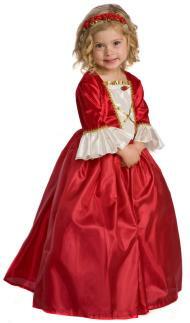 One Lucky reader will receive a princess dress-up of their choice from My Cute Dressups! Leave a comment~ Visit http://www.mycutedressups.com/ and let me know which dress-up costume you would love to give your little one this holiday season. The comment is considered your entry. Entry to this giveaway ends at 12pm PST December 10, 2010. Winner's are chosen randomly through random.org. The winner will be announced in a post within 7 days of the giveaway ending, and contacted through email. The winner will have 48 hrs. to respond or another winner will be chosen. I'd love to gift the Winter Beauty Princess Costume. I would choose the Sleeping Beauty costume for my 3yr old. She would love it! following you via GFC and I like the Fancy Rapunzel Princess Costume for my little one! I would love the Arabian Princess Costume for my daughter.